Delray, Florida is notorious for its active nightlife, especially on Atlantic Avenue. Locals refer to the loud, entertaining street, full of upscale restaurants and bars as “The Ave”. If you live near Delray Beach, you probably have spent a decent amount of money throughout your residency on “The Ave” for some unforgettable nights. Although the plethora of tasty restaurants and boisterous bars are worth every penny, you should consider saving a few nights’ worth of money and spending it on something extremely beneficial and long-term. Florida is prone to strong storms, heavy rains, and damaging winds all year around. Empire Construction and Development provides protection from any weather conditions that jeopardize you and your families’ safety and homes. Rolling shutters are one of the many storm shutters that Empire Construction and Development offers to its customers worldwide. All our shutters have been reviewed and are accepted by the Miami-Dade County product control division, Florida Building Code, and the International Building Code. Empire Construction and Development is an A+ rated business and is very reliable. If you need to return your shutters for a different size or color and anything in between, our rolling shutters come with a guaranteed 5-year warranty. Roll down shutters are made of strong, durable, and high-quality aluminum to protect your home from anything that threatens it, including strong winds, tornados and hurricanes. Our shutters also provide protection from sun exposure and keep the noise from storms out. Rolling shutters are custom made and are available in a variety of colors such as white, ivory, beige, and bronze so that they can blend into any business or home. Roll down shutters improve the visual quality of your home with its sleek European look. 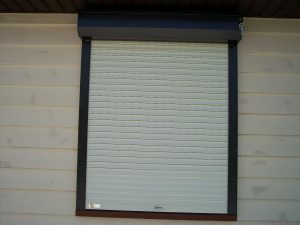 Rolling shutters are easy to order and even simpler to install. If you have any questions on how to put up your shutters, Empire Construction and Development offers a step-by-step tutorial. When a storm alert goes out, you and your family already have plenty of precautions and errands to run before it hits. If you install our rolling shutters, protecting your home doesn’t need to be added to your to-do list. Within seconds, you can crank down your shutters with a manual crank or upgrade them to a fully synchronized electric motor drive. Empire Construction and Development offers a free estimate on how much your rolling shutters will cost in Delray Beach, Florida. There is now an easier way to pay for your storm shutters; we accept payments through PayPal to help break up the cost. Contact us for any questions you have when buying or installing your rolling shutters. If you live in Delray, Florida, rolling shutters are the best financial investment to make. This entry was posted on Sunday, January 27th, 2019 at 9:26 pm	and is filed under Decorative Shutters, Hurricane Shutters, Rolling Shutters, Storm Shutters. You can follow any responses to this entry through the RSS 2.0 feed. Both comments and pings are currently closed.